Red Green . 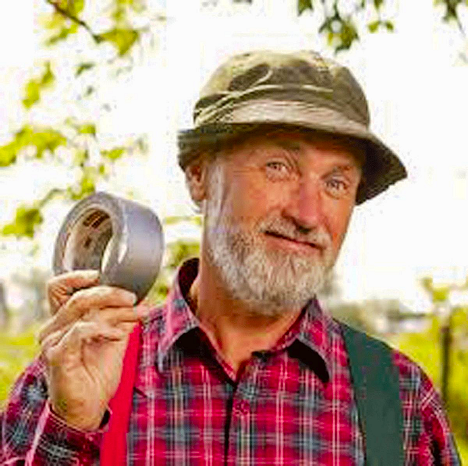 . .
No, not this guy, who can build pretty much anything with duct tape. It’s more like Red v. Green. As in Antifreeze. Jan had her very last doctor’s appointment today, a wrap-up with her oncologist. But since it was at 12:30 we decided to have lunch first, this time at East Star Chinese Buffet, where we haven’t been for a while. We knew we were getting there early, about 10:45, and figured we’d just wait until they opened at 11. But we found they were already open, so we went in and got started. However they were still putting food out, but somehow we did find enough to eat. Really delicious, and of course, VERY fresh under the circumstances. Afterwards, we had enough time for me to pick up a couple of things at WalMart before heading over to the doctor’s office. Since Jan had already had gotten a good report from her mammogram so this was just a final checkup. One thing that Jan was hoping would happen, and did, was that since it’s been 5 years since her cancer, her doctor took her off her cancer preventative, Anastrozole, that she’s been taking. She started out on Tamoxifen, but had a very bad reaction to it, saying it made her feel like she was crawling out of her skin. So after a few months, the doctor switched her over to Anastrozole. And she’s had no problems since. But she was glad to be off it anyway. And after another stop we were on our way home for the day. I talked to Cummins again yesterday, but not about my oil filter, or my Onan Genset. This time is was about antifreeze, and the whole Red v. Green thing. Our RV has the Green diesel antifreeze in it, and though I don’t use a lot, the green version is getting harder and harder to find. In fact, truck stops like Flying J and Pilot no longer carry it, at leas the ones I’ve checked. And the last time I bought some I had to order a case of 4 from NAPA. And the price has doubled since then. So I’m probably going to change over to the Red version sometime in the future. But I’ve heard a lot of stories about whether or not they can be mixed, with people who should know on both sides of the issue. Plus now, there’s all the in-between colors, like pink, orange, and yellow. Mixtures that some say can be used to transition between the other colors. Drain the Green antifreeze, fill the engine with distilled water, and then run the engine for about 15 minutes. Then ideally, drain the water and do t this again. Finally change out the coolant filter and fill the engine with the Red stuff, and I should be good to go. But first there’s my engine oil leak problem,and of course, my long-neglected Onan Genset problem. Vending machines are twice as likely to kill you than a shark is But at least a vending machine will give you potato chips before it kills you.